In today's business world, your bottom line isn't measured by your company's financial performance alone. Social Entrepreneurship For Dummies shows you how to implement social responsibility to your business plan in order to increase your bottom line. This book helps any social entrepreneur gain the necessary skills needed to change the system and spread the solution, while providing explanations of the most successful business tools being used today. 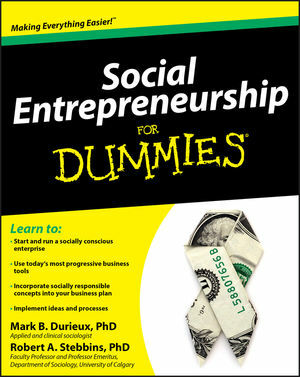 Social Entrepreneurship For Dummies gives you the trusted and friendly advice you need to get on your way toward social responsibility! Mark B. Durieux, PhD, is an applied and clinical sociologist who teaches and consults widely on the practice of social entrepreneurship. Robert A. Stebbins, PhD, is a Faculty Professor and Professor Emeritus at the University of Calgary and is known for his research on leisure and volunteering. Part I: An Introduction to Social Entrepreneurship. Chapter 1: Social Entrepreneurship: A Calling for You. Chapter 2: Building Public Compassion. Chapter 3: Motivation and the Volunteer Spirit. Chapter 4: Communicating for Social Change. Chapter 5: Using Trends to Harness the Next Big Things. Part II: Establishing Your Organization. Chapter 6: Finding Your Focus: Civil Society’s Many Faces. Chapter 7: The Ground Floor: Doing the Initial Planning. Chapter 8: For-Profit and Nonprofi t: Considering Your Options. Chapter 9: It Doesn’t Grow on Trees: Funding Nonprofits. Chapter 10: Creating Your Brand. Part III: Growing Your Organization. Chapter 11: Mixing It Up: Using Social Networking and Social Media. Chapter 12: Greenroom Strategies: Winning with the Media. Chapter 13: Keeping Kafka at Bay: Dealing with Bureaucracy. Chapter 14: Going Corporate: Formally Organizing and Incorporating. Part IV: Keeping Your Organization Running for the Long Haul. Chapter 15: Putting the Entrepreneur in Social Entrepreneurship. Chapter 16: Leading Indicators: Leadership and Your Organization. Chapter 17: Managing a Social Enterprise. Chapter 18: No Man Is an Island: Teamwork. Chapter 19: Ten Great Areas for Social Entrepreneurial Action. Chapter 20: Ten Common Mistakes to Avoid.